Wishing you had more pronounced cheekbones? Sighing over your lack of anime-like eyes? 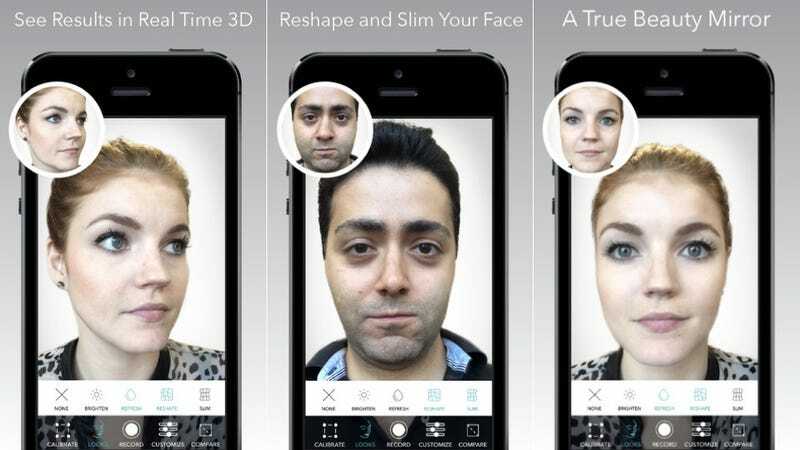 Well, there is a new app that'll allow you to play plastic surgeon with your very own visage. It's not magic, but it's subtle and reasonably effective. Oh, and totally dumb. What's the point? In addition to enhancing self-portraits, Aarabi said the company plans to use the technology to help skin care and cosmetic companies to showcase their products. "Selfie apps have become all the rage. The ability to change 2-D photos before uploading them to Facebook has been really popular, but now people can take video and touch it up using the app too," he said. "They look the same but everything is just a little better - their wrinkles are gone, their eyes are retouched," explained Aarabi. Heaven forbid anyone appear on a public social network with wrinkles—or, worse, in public. Better pull out your wallet and order some $250 miracle serum from Sephora!